Squeenix dropped Tactics Ogre: Let Us Cling Together unexpectedly into Australia retail. It’s a PSP remake of the original Tactics Ogre game which featured on the SNES. Tactics Ogre is yet another turn based strategy game developed by the guys who went on to produce Final Fantasy Tactics and Vagrant Story. It features a branching storyline, and enough tricky combat tactics to keep you busy for some time – it’s dislodged Z.H.P as my current carry everywhere PSP title. The Australian retail box is a “special edition” which contains a minimalist artbook (meh) and a mini soundtrack. The PSP remake features a few nice view options, but doesn’t appear to have been drastically altered from it’s original SNES format graphics, which is a nice change. 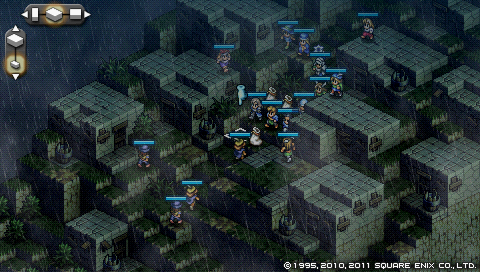 Players familiar with Final Fantasy Tactics Advance or A2 will find the visual style familiar. Finally! A fight we can win! Interestingly enough, the game features a screenshot option, and has extra scenarios for you to play through once you’ve finished the main game. So far I’ve only finished chapter 1, and that’s already taken a few hours of my life to achieve. Battles are difficult, but not impossible – occasionally a battle really comes together well and you can storm through it, but in general they feel genuinely difficult as you face poor terrain hindering your units mobility and face powerful enemies who shrug off attacks. This, however, rarely crosses the boundary to unfair – and frequently the best way to finish a mission is to rush for the goal than to cautiously fight through the enemies. Overall, an excellent member of the genre, and worth the time and effort. The branching storyline should also offer a fair bit of avenue for replay. Because I’m lazy (that’s why there hasn’t been a post in here for ages…) I’ll give the ultra quick reviews! Guitar Hero: World Tour (PS3): Guitar Hero is finally back, after the lackluster Guitar Hero 3. The new game mechanics make for some more interesting and challenging play, and the soundtrack is actually pretty good. About 25% through career mode for Solo Guitar. Drum kit is nice and sturdy, shame about the calibration (fortunately I have a USB-MIDI adapter so I was able to fix it up using the Drum Tuning Tools that Activision/RedOctane released). Armored Core: For Answer (PS3): More of the same giant robots on ice skates action (*ahem*). Plays like Armored Core 4, only with a more comprehensible story arc, and some better revised equipment. Quad-Legs are king-of-the-hill for mobility again! Banzai! I still find myself playing this with my finger firmly pressed on the boost button all the time. Grand Theft Auto 4 (PS3): I finally caved and bought it. I’m glad that Rockstar didn’t go for another round of gang mentality after San Andreas. Car controls are twitchy, but all in all, enjoyable so far. Gears of War 2 (X360): More Gears of War. If you’ve played and enjoyed the first, you’ll love the second. ’nuff said. Valkyria Chronicles (PS3): Simply brilliant from storyline to mission design and gameplay. If I wasn’t half-stuck on a mission, I’d still be playing this non-stop. Race Driver: GRID (PS3): High speed arcade racing. Not bad, but not for realism junkies. Couldn’t seem to get it comfortably configured to play with my steering wheel, but playing using a Controller is quite satisfying none the less. Mirror’s Edge (PS3): This game was a real surprise for me – innovative gameplay in a first-person perspective – rather than being a shooter, we have ourselves a first person runner. The controls make free-running plausable in the first person view, and with a bit of practice you easily find yourself running through the levels at full speed and seriously considering making attempts on the speed-run records. So after all of that, my main recommendations are: Valkyria Chronicles (PS3 Only) and Mirror’s Edge (PS3 and X360) – both are excellent games with a fresh take on their respective genres.